Vintage English Deco Rug by Hildo Krop, Country of Origin: England, Circa Date: Early 20th Century – This beautiful study in modernist abstraction is a fascinating study in vintage rugs, and may conceal a wealth of traditional oriental secrets. Could it be that there are finely rendered Chinese frets or meanders and curling arabesques sprawling asymmetrically across the surface? Dare we see a large irregular ivory medallion here with corner pieces in the lower area? Is this a stunning modern deconstruction on the ancient vocabulary of rug design, or are we looking at Gorky or Miro translated into decorative floor-covering? Hildo Krop was a famous sculpt, potter, designer of furniture, etc, and was forerunner of the style “Amsterdamse School” in the 1920s-1930s. 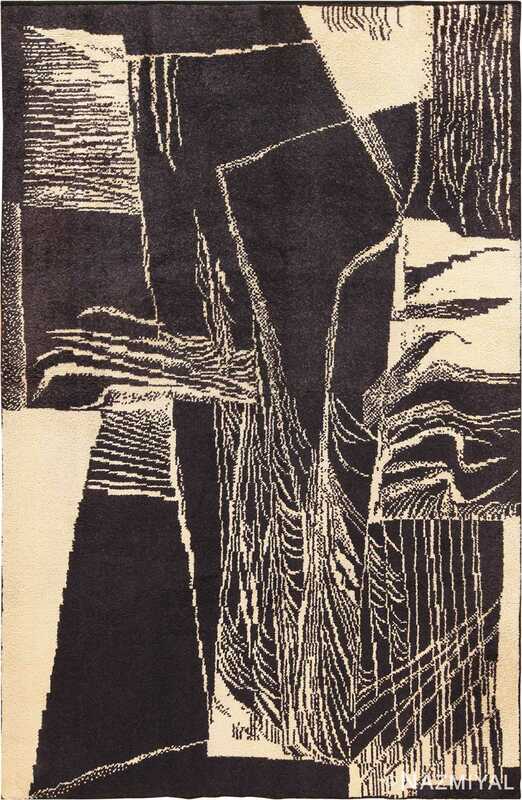 If you rotate the picture 90 degrees right, you will notice two figures on the left hand side of the carpet with blond hair, arms raised (typical for Hildo Krop sculptures and graphics). 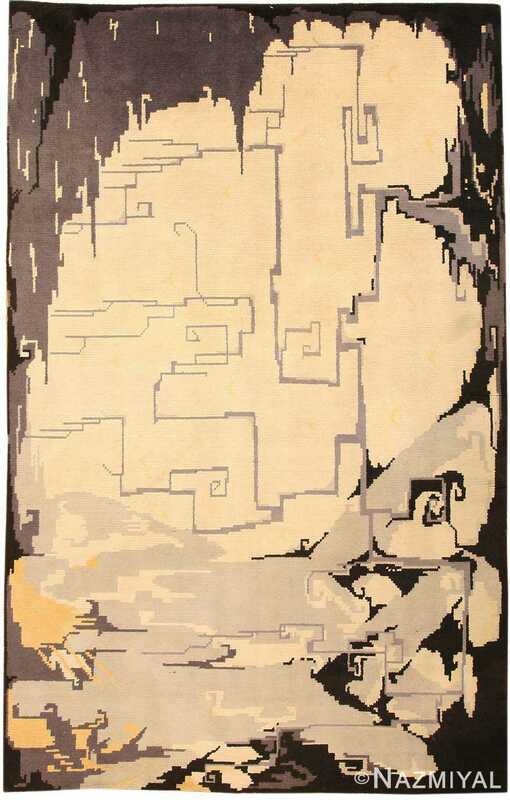 Art Deco Hildo Krop Rug – Browns and beige’s and yellows are intriguingly swirled together in this captivating and beautiful art deco rug that is perhaps more immediately reminiscent of an abstract painting than it is of what one is used to thinking of when one imagines a rug. But then, perhaps that’s the point. The intriguing and asymmetrical composition of this piece is jarring for its apparent lopsidedness, but rather than being intimidating for its eccentricity, it is instead somehow inviting: one cannot help but want to get a closer look at it, to get up close and really study it. Perhaps because it so boldly challenges our conventional thinking. Perhaps because of something deep and hard to explain. Or perhaps just because it’s clearly so beautifully done. Looked at in a portrait orientation, this rug might suggest any number of images. Perhaps the entrance to a cave, or a huge smoggy cloud in an evening sky. Looked at in a landscape orientation, however, there is one image that more aggressively jumps out: that of a pair of blonde haired people down on bent knees before a smoldering fire. 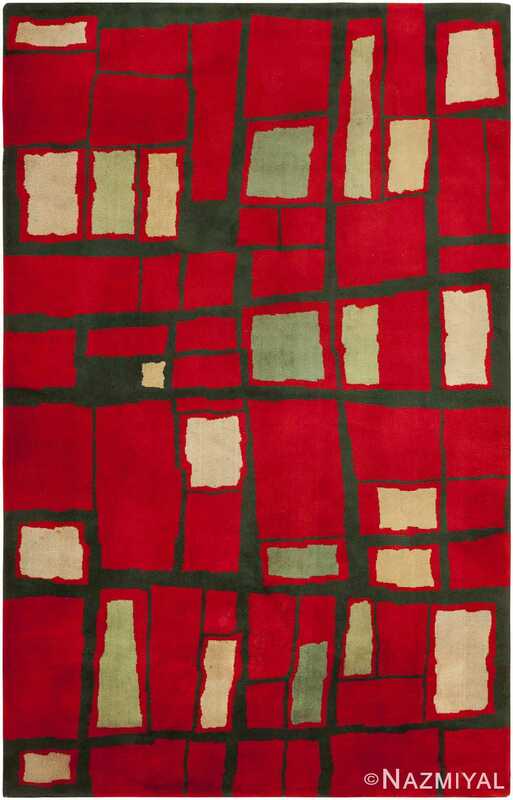 When I first looked at this rug that way and saw that image, I was taken aback by it and couldn’t help but smile. There’s something deeply satisfying about making that connection with this piece, and seeing the designer’s clever handiwork come to life. The artist responsible for this stunning piece, Hildo Krop, was a forerunner of the “Amsterdamse School” of aesthetics that was important in art from the 1920’s through the ‘30s. The blonde subjects are typical of his other work, which includes sculpture, pottery and furniture. Art deco pieces are often imaginative and deliberately unconventional, traits that make it one of the most interesting and distinctive of all modern styles. 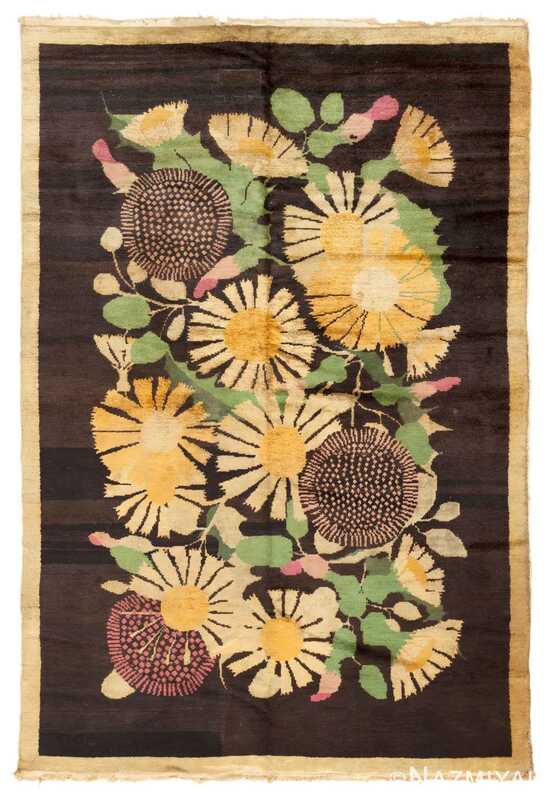 Woven in the 1920s, this fanciful French Art Deco carpet features a bold bouquet of stylized flowers that was undoubtedly ahead of its time.